Do you have a big corporate or group outing coming up and can’t quite figure out how to make it something to remember? Throwing a group event isn’t all that hard in general, but to make it epic takes a little something extra. Luckily, that’s where Skate World in Deer Park, Texas comes in! 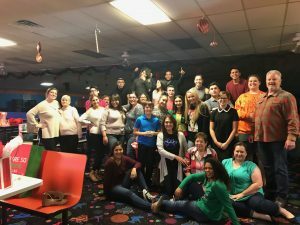 At Skate World, we specialize in all kinds of group events and outings. From corporate work parties, and team celebrations to scouting outings and church groups, we do it all. We also specialize in large groups. Our skating center can handle some seriously big numbers and we offer discounts for groups over 100 skaters. So why skating, you might ask? Well, that’s easy! Skating is one of the oldest pastimes in the country and it’s been around for this long for a reason. lacing up a pair of skates brings you back to a simpler time where fun was analog and it happened with good friends and family, live and in person. That’s still the way we do it in Deer Park. We let the DJ crank the best dance tunes and we open up our hardwood roller rink to you and your group for a night of good old-fashioned fun. It’s just that simple! Having your group event with us at Skate World is memorable because you’ll all be here, you’ll all be in the moment together, and you’ll all have the time of your life. What more could you ask for?